Brian Trager, a faculty member in NTID’s information and computing studies department, will be teaching classes in the new mobile app development program. 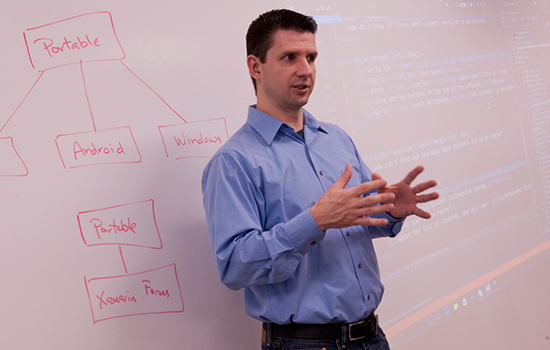 When faculty members at Rochester Institute of Technology’s National Technical Institute for the Deaf were creating a new degree program in mobile application development, they looked to cross-platform developer Xamarin Inc. for guidance and expertise. The result of this collaboration is the fall launch of a new academic program, which recently received approval by the New York State Education Department and earned a grant from the National Science Foundation of more than $820,000. Funding from the three-year NSF grant, “RoadMaPPs to Careers: A New Approach to Mobile Apps Education featuring a Mapp for Deaf and Hard-of-Hearing Students,” will train and equip students in RIT/NTID’s information and computing studies department where the new program will be housed, and is based on the Xamarin cross-platform approach to mobile application development. Headquartered in San Francisco, Xamarin assisted in the development of the new associate degree program, and company representatives serve on the advisory board for curriculum review. The company recently was acquired by Microsoft. The company also will support student-learning activities such as career awareness events and will hire students for co-op and full-time employment.